We are now affiliated with the NRA! To join or register for upcoming events, use our online contact form or contact one of our officers. 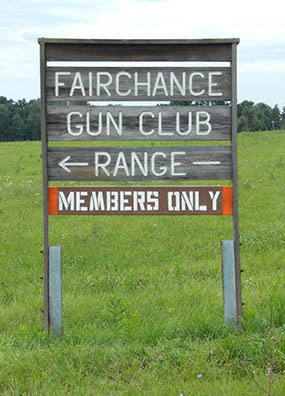 Fairchance Rod & Gun Club operates a shooting range and coordinates sport shooting events in Fayette County, PA. We are a membership-based club with an outdoor range and covered shooting areas. We do have facility for Trap but no one to operate it. Therefore no shotguns are permitted to shoot at the provided target boards on the range. If you're interested in joining our Uniontown, PA area gun club, start by downloading our rules, by-laws, and membership application. Then use our online contact form or contact one of our officers to start the process of joining our gun club! We have plenty of events coming up this year, including competitions and gun training programs. See our upcoming match details for more information. Feel free to contact us with any questions you may have by simply using our online contact form or calling our member contacts.